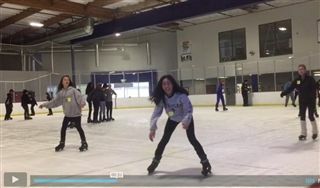 On Friday, May 27th, 8th-grade students traveled to Carlsbad's Icetown skating rink for a morning of chills, thrills, and quite a few spills! The field trip gave students an opportunity to bond with classmates and celebrate the end of the school year, while participating in a P.E. activity uncommon in warm and sunny San Diego! Click here to watch a fun video of the day, created by Coach VanderHorst.